While most may consider office cleaning to be a time-consuming exercise that doesn’t always have to be the case. In fact, there are a number of cleaning shortcuts that you can utilize to increase overall efficiency and in a commercial setting where time is money, this is certainly an attractive prospect. For the sake of convenience this article will approach the subject systematically and will identify those areas that are typically time-intensive. So let’s take a look at some of the time-saving tips that will improve not only the look of the office environment, but also the health of your employees and the figures belonging to your cleaning budget. A quick tip is to microwave a slightly damp and new (new!) sponge for 30 seconds before use, never after. The benefit of heat is that it can kill close to 99 percent of bacteria even if the effect will be short-lived. Additionally, your cleaning staff should have easy access to hot water so that their routine is a) easy to undertake and b) more efficient at killing germs. A diluted disinfectant can be used across the board for maximum effect in place of bleach which should really only be reserved for bathrooms and industrial kitchens. Contrary to popular belief microwaves are generally safe for longer periods of time without routine cleaning as the heat generated prevents bacteria from colonizing – unless of course it looks like it needs it. 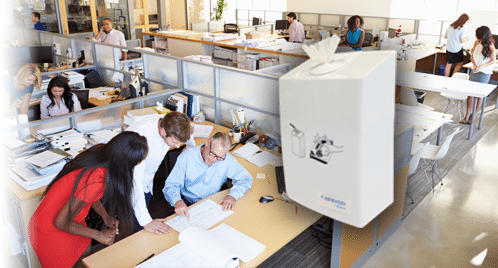 This is a great place to install dispensers of disinfectant wipes for your employees to use which will dramatically reduce the amount work your commercial cleaning staff will need to perform. This is also a safer alternative for employees as opposed to paper towels and can viably supplement or replace soaps entirely if you so choose. 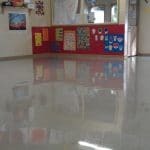 The floors are one thing that absolutely cannot be missed however and a specific mop and bucket should be reserved for this cleaning routine to avoid cross-contamination with any other floors or surfaces in the office. Provide your employees with sanitizing wipes for their computer, keyboard and mouse and ask your cleaning staff to focus their efforts on cleaning the less-personal items such as the desk and the phone. Everything else will be pretty much in the clear, especially if employees are operating in their own individual areas. For open-plan offices the cleaning process will require a little more time as the potential for cross-contamination and the spread of germs is much higher. 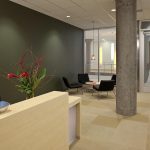 What most people don’t realize is that the first five steps into any office building coming in off the street or from the entryway is an area which is statistically highly contaminated by foreign germs and bacteria. As such, it is a must that carpet cleaning powder agents are employed in the general vicinity while vacuuming. This has the added benefit of reducing the need for regular steam cleaning. Cleaning staff should be educated in which particular stains require which particular cleaning agent. Furthermore, spot cleaning can be as effective a solution as vigorously cleaning every inch of a floor or countertop in most cases. On one final note remember that regular cleaning agents work just as well as disinfectants which tend to be more expensive and that using disinfectant wipes will suffice for those areas where food is prepared. And there you have it! If you make use of these simple tips you’ll not only save on time, you’ll likely save a few dollars as well.